Discover The Richest Silver Mine in Arizona: The Silver King Mine! 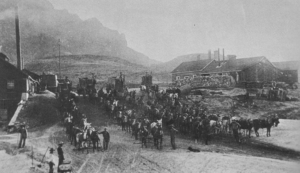 The Silver King Mine, east of the Superstitions, originates from during the Apache Wars. With an attempt to create an easier access route into the Pinal mountains, came a wondrous discovery. Sullivan, a local solider assigned to the construction of the road discovered a slew of heavy dark rocks known as “nugget silver”. Having never divulged the location, Sullivan disappeared and is believed to have been killed off by the Apache. However, Sullivan had left markings to designate his discovery. Years later, workers from a ranch that Sullivan worked on eventually located the wonderous discovery he had left behind. Thus begins the fascinating delve into the geology and mineralization of the region. Mineralization is hosted in Pinal Schist and in Silver King Quartz Diorite, also boasting veinlets interlaced in quartz diorite porphyry. 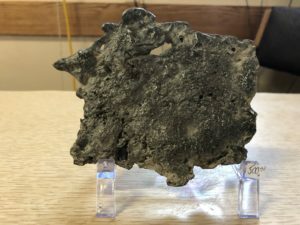 The ore was cropped out of the top of a hill ranging to about 75 feet and included a composition of stromeyerite and highly argentiferous tetrahedrite with some acanthite. The mine operated heavily during 1875 and 1900, produced an estimated $42 million worth of silver ore and became the richest silver mine in Arizona history. The ore was initially shipped to San Francisco for processing, while the smelting operation was located a few miles out from the mine. With time, ore quality deteriorated and silver prices dropped, prompting the sale and closure of the mine. Eventually, the Silver King of Arizona Mining Company acquired the mine in 1916 and briefly continued limited production at end of World War I prior to the final closure in1920. Over the life of the Silver King approximately 6.2 million ounces of silver were recovered. Slag, the after material after silver has been melted, has been collected from around the Pinal mill. Purchase silver slag, at the Mammoth Mine Rock Shop here. Diane Kotila on Discover Rare New Goodies, Better Than Halloween Candy!